If you are employed at a union — an organization whose purpose is to improve working conditions for its members — you would expect your own working conditions to be beyond reproach. Any problems that exist should be quickly and efficiently handled by your staff union through the collective bargaining that the union works for. But that’s not always the case. When labor is management, it assumes the role of the boss, warts and all. This means taking responsibility for the financial health of the union as well as for the employees’ well-being in the workplace. Some union officers are up to the task. Others are not. 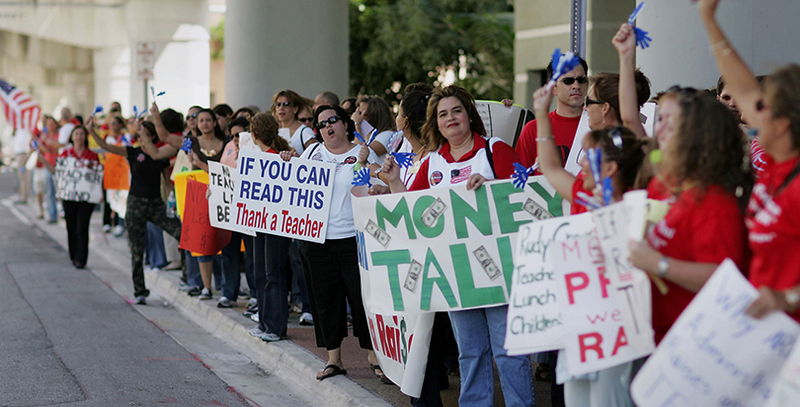 The Florida Education Association employs about 100 professionals who work both at union headquarters in Tallahassee and in the field with local affiliates across the state. They are represented by a staff union that recently entered into negotiations with FEA for a new collective bargaining agreement. In preparation for the talks, the staff union surveyed its members to determine which issues were most important to address. About 83 percent of the staff responded. The results, anonymized to protect the identities of the respondents, indicate significant problems not only with working conditions but with the direction of the organization. 1. Lack of vision and focus. Staffers felt there was “confusion in direction of our mission” and little sense that FEA officers had a plan. “Dealing with HQ BS — egos, departmental silos, lack of leadership and communications, management chaos and lack of direction, vision — no clear strategy for path ahead, etc. Going downhill fast!” wrote one employee about the current environment. 2. Worthless meetings and poor training. Staffers felt there were many “unnecessary or directionless meetings and trainings” — too often lectures or PowerPoint presentations. 3. Poor communication and coordination. “Management needs to practice what they preach and give staff a real voice in how to carry out the work, strategizing on approach, allowing inter-departmental teams to collaborate,” wrote one staffer. 5. Heavy workload. There was consensus that FEA was understaffed and employees were expected to be on call 24/7. One employee was especially vivid about the situation. An official said the union had not seen the results. Complaints by workers are part of every workplace, but that’s the point. They are not supposed to be so pervasive in a workplace run by a union, and certainly not over what appears to be a long period. We can draw different lessons from this. The one I choose is that labor peace is achieved through the efforts of sincere, well-meaning people. There are bad managers and disgruntled employees regardless of whether one side or the other, or both, hold union cards.